I was an average person playing football and enjoying other athletic sports such as karate, then at the age of ten years old I had a brain haemorrhage. The bleed was mainly in the Cerebellar which is the part of the brain which controls of the moment; this completely stopped me from moving and affected my speech. I remember walking down a corridor and my legs were giving way beneath me, at this point I was rushed to Great Ormond Street Hospital where I received lifesaving treatment and was operated on by top brain surgeons. I truly believe I wouldn’t be where I am today without the support of GOSH. My recovery is all down to the extra support I received within those early stages of my treatment whilst in intensive care. As I started to show signs of movement again I was told by the doctors that I would never be able to walk or talk again. Over the past seven years it’s been a struggle, a massive uphill struggle – learning to walk again has been very difficult with the scrapes and bruises I would incur when trying and learning to ride a bike was completely demoralising. With both things you know how to walk and ride a bike, however you’re unable to do it. I was telling my body to do one thing and not getting a response, it would do it’s something else. I had to keep telling myself that there are people out there go through this type of thing, every day. If you think you’re the worst off – stop! There will always be someone else going through more than what you’re going through. 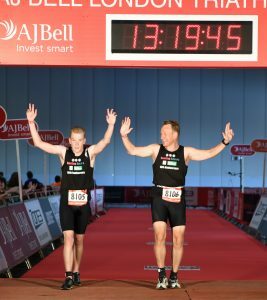 My participation in the London Triathlon was about marking something for me – it was marking the fact I could do it. 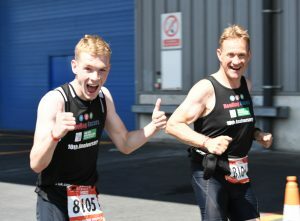 I may have not completed the race with the best time, however in my eyes any time was the best time. I was very pleased with my swim and my cycle – I sprained my ankle on my run which I was not so pleased about.